Courtesy photo: Interbay Village is ready for upgrades and additional tiny houses to help people experiencing homelessness as they wait to transition into more permanent housing. The Low Income Housing Institute is moving forward with an expansion of its city-funded tiny house village in Interbay, which will add more shelter and site upgrades for its growing number of residents. Interbay was one of the three original villages set up to temporarily house the homeless in 2016, moving to the Port of Seattle’s Tsubota property near the Magnolia Bridge in November 2017. There are 24 tiny houses on the 11,300-square-foot site currently, as well as several dormitory-style tents. The Seattle Department of Construction and Inspections issued a six-month temporary use permit for an 18,000-square-foot encampment last July, which triggered the need for a SEPA environmental review. Magnolia resident Elizabeth Campbell and her Safe and Affordable Seattle (SAS) group filed an appeal to the Hearing Examiner after the SDCI director determined the expansion would not cause any significant environmental impacts. The Hearing Examiner cleared the Interbay Village expansion to proceed in November. There will be 23 new tiny houses built on the north end of the property, Reynolds said, with 21 to be occupied by residents. The other two will be for an additional case manager’s office and a storage unit. Seventeen tiny houses have been moved onto the property, with six more to go. The Rotary Club of Mercer Island will begin constructing a tiny house at the site, 1601 15th Ave. W., on Friday. The club raised funds last year to support the creation of 10 tiny houses at True Hope Village, and this year is providing $22,000 for another nine. Five vocational organizations are constructing eight, which could be sited at a future tiny house village in Seattle. While the rotary club has financially supported 19 tiny houses in the past two years, about a dozen volunteers will be on hand to build one from scratch starting on Friday. Site improvements as part of the expansion of Interbay Village include the addition of four new bathroom/shower units, plus washers, dryers and a new kitchen facility. Each tiny house will also be fashioned with porches. “We anticipate that will be finished by the end of April,” Reynolds said. 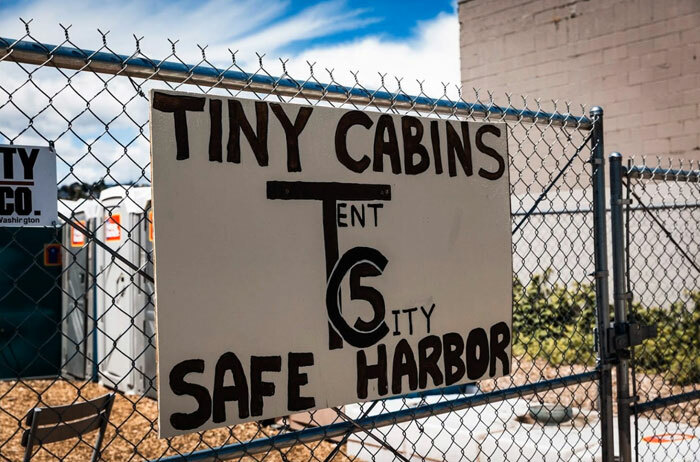 Interbay Village has a model that includes self-management by Tiny Cabins Safe Harbor residents, who voted last summer to remove SHARE/WHEEL as the site manager. LIHI stepped in, and there is a site coordinator who helps manage daily operations. LIHI terminated its contract with SHARE/WHEEL several months ago and took over management of the low-barrier Licton Springs tiny house village, which closes at the end of March. “Right now we’re in the final week or so of making sure everyone has housing when they leave the village, so they’re not back on the street or in a lesser quality shelter situation,” Reynolds said.